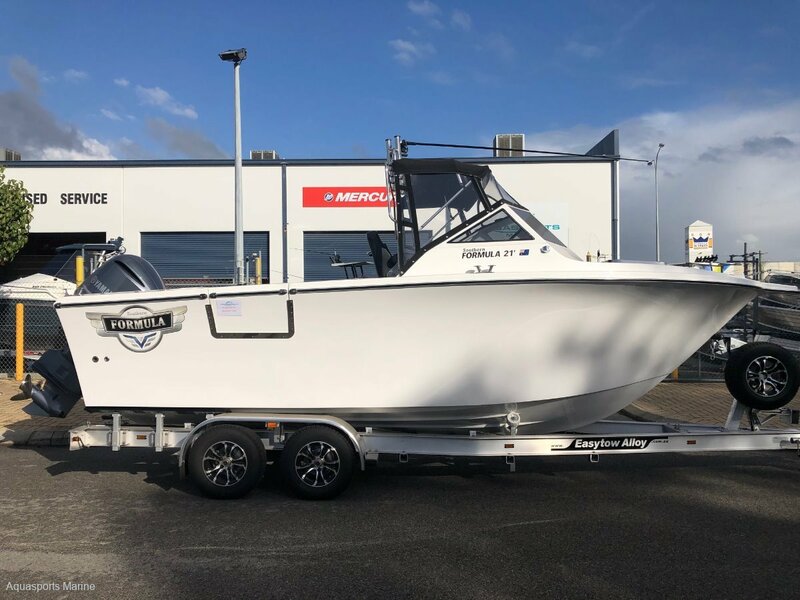 Southern Formula is the brainchild of John Haber, owner of Haines Hunter boats, and the old-school design, and name throwback to the Haines Hunter Formula 233, certainly had people talking and wondering if this boat was a flop of the old 233 or a new design altogether. However the Southern Formula 24 and the 21are nothing like a 233 and is its very own beast. Anyone familiar with old Haines Hunter models could instantly recognise this boat was markedly different. While the deck and wavebreaker might have some 80s flair, nothing else about it has the design characteristics of an old Haines Hunter Formula. The sides, bow and all-over lines of the Southern Formula are an original design. Doing something original while keeping that old-school look wouldn't have been an easy feat, and making it look great at the same time is even harder. On and off the water, it's an impressive-looking vessel. It's tough, sleek and has huge presence. The Southern Formula 24 and 21 now available with the 19 due later this year. Photos for Illustrations purposes only and may include options not included in our pricing.